Ever wish you could make your dashboard look great on desktop and on mobile? Say hello to device designer in Tableau 10! With this new feature, you can design, preview, and customize a dashboard’s appearance on phones, tablets, and desktop monitors. Then you can publish a single dashboard to Tableau Server with optimized viewing and interaction across a range of devices. When you open a dashboard, you’ll notice a “device preview” button in the dashboard pane. Clicking the button reveals two new authoring tools that preview the dashboard layout across a variety of device types and models. The first is the preview toolbar. It lets you select from a variety preview device types (desktop, tablets, and phones) and models (iPhone 6S, iPad Pro, etc.). The second is a black outline of the device’s screen (in logical pixels) overlaid on your dashboard. We call this the preview frame. In the example below, notice that the dashboard extends beyond the borders of the preview screen (the black outline). This would be a bad experience, requiring horizontal and vertical scrolling to access the entire dashboard. But there’s an easy fix! Click the “add tablet layout” button in the preview toolbar. That creates a special customization of the dashboard that we call device layout. With device layout, you can customize the dashboard’s content on a device by its sizing behavior. For this dashboard, I’ll select the “fit all” option, and the dashboard will automatically scale to fit inside the preview frame. This feature is deceptively simple yet powerful. You can use it to check your existing dashboards and see how they appear on various devices. You’ll be surprised by how many work well on numerous devices with very little modification. With device designer, your original dashboard becomes the default master template. Worksheets, actions, and formatting are shared across device layouts and the default dashboard. This is intentional as we want to create a single dashboard that’s optimized for viewing across devices. And since each device layout can have its own sizing behaviors, you can control the worksheets that are displayed as well as their respective sizes. 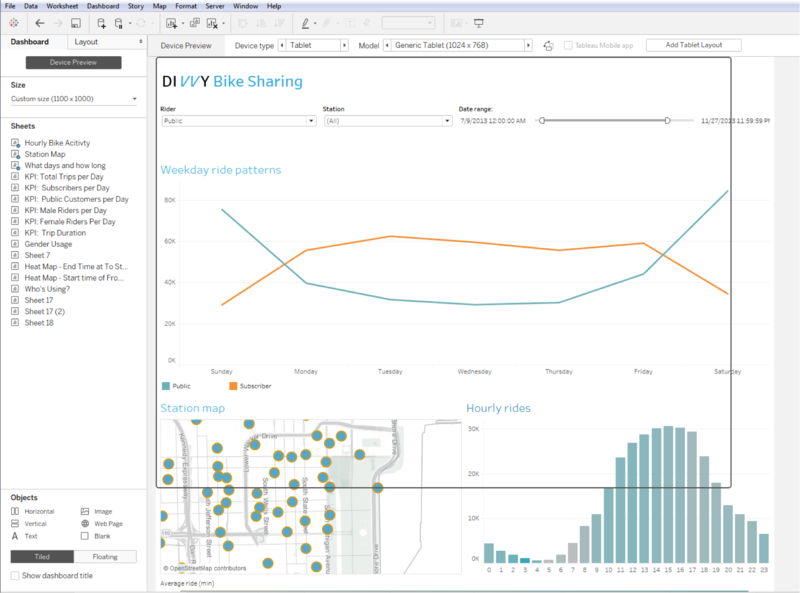 When you’re ready, simply publish to Tableau Server and pull up your dashboard on any device. Tableau Server will automatically detect the width of the device’s browser window and serve up the appropriate layout. You only need to remember one URL since it’s a single dashboard. Better yet, forget URLs and just use the Tableau Mobile app for phone or tablet! we know Tableau 10 is coming, but the basic problem of tableau auto size resolution is not sorted . I had told this to tableau team many times. But no update on this . Thanks for the feedback! I am a product management intern here at Tableau working on Dashboards. Can you clarify a bit more what you mean by auto size resolution or also point me to the forum post about this? I want to see if I can help! Thank you! For the new versions....It's time for Tableau to do a quantum leap Improvement... We need spatial 3D Visualizations! so we can create graphs in 3D for the 3D world we live in.... Fraking 3D models for seismic data, radiation effects on space bodies, Infrared maps, DNA models, molecular structures, mechanical parts heat maps, avionics metal stress crack detections, 3D graphs layers with one graph on top many on the bottom...flip 'em like a book!, etc - just give us the tools, we take care of the rest.! Hi. Does any dashboard can be viewed on different devices like laptop, mobiles and on Tableau server 10 etc. If we select resolution as automatic than is it possible to view on any device. 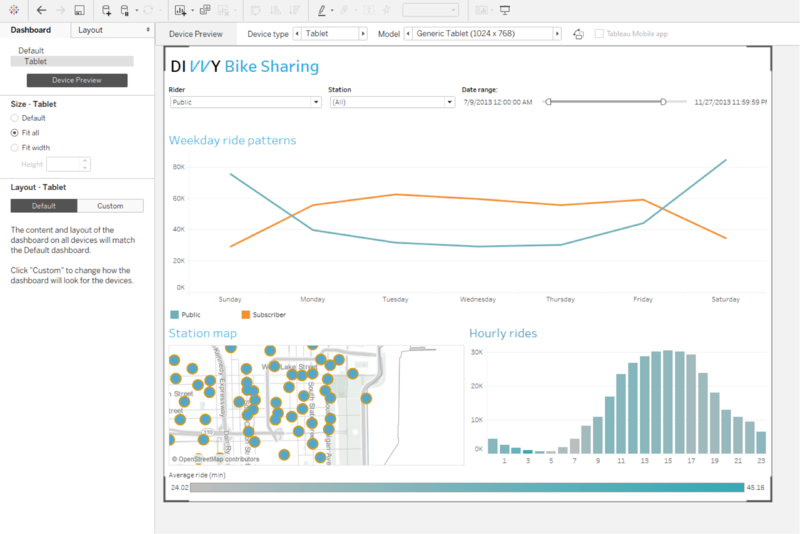 "When you open a dashboard, you’ll notice a 'device preview' button in the dashboard pane." Sorry, I can`t find that button! I've downloaded v10 and tried this feature, it simply isn't implemented correctly, I'm not sure if anyone at Tableau actually tested this on a real device. For example, create a worksheet and select an iPhone layout. When you publish and view the dashboard on a real device using Tableau mobile app, all the fonts are tiny. The fixed layout sizes for mobile do not seem to consider the pixel density of the device they are displayed on. How do you recommend dealing with not being able to use the "show sheets as tabs" functionality if you want your dashboard to generate across devices? The only thing I can think of is to go back and put action filters everywhere to allow users to navigate workbooks. Seconding this. It's absurd that I have to give up not only navigating across worksheets, but filters that apply across all worksheets, just to have device optimization. It's not a very worthwhile tradeoff. When embedding the Viz into my website, I am still experiencing problems with width and height (though the dashboards look perfect on the Tableau site). Will responsive embedded dashboards be supported in Tableau 10, perhaps through revisions to the beta? It's a very important feature. Let me know if you've got any more questions around it. Device is not available for 'story'?? I do not see that option for 'story'... so i went into each dashboard and added the device layout.... but it still doesn't work as a 'story' level.... how can we get around this??? I have the same issue : it would be very useful to be able to use device settings on story level. Maybe the story can just use the device setting for the active dashboard? This would avoid the need for setting device settings again on story level. Device designer should be more flexible to allow the user to format objects for each layout. It would be much more useful if I could do things like change font sizes for titles for each specific device. This feature is great, but does it only work for Tableau Server? It would be nice if this feature worked for all dashboards seen on mobile devices (for example, those embedded on pages or in Tableau Public). Sounds great, but the implementation of this feature seems incomplete. As several other posters have commented, device layouts do not translate to stories. Is there a workaround for this? I have Tableau 9.3, I want to develop a dashboard to be able to see on an ipad/iphone, is it possible to do in 9.3. If yes please let me know the steps to follow.